This solution is often used to cover pools prior to paving or during landscaping around the pool. Board and Plank covers are a viable and cost effective solution to ensure safety and compliance on site while your paving is installed or landscaping completed. We offer a fast and efficient next day installation service that will ensure you keep compliant with local bylaws and legislation. We also work and liase directly with your pool builder to design a custom solution to match the size and shape of pools or excavation zones. Consolidation is SPASA member and we are fully Tested and Certified to Australian Standard AS 1926.1-2007 - Swimming Pool Safety - Safety Barriers for Swimming Pools. Councils require open pools or construction holes to be safe and covered, particularly if a work site will be under construction for longer periods. Legally only a maximum of 300mm of water is allowed inside a pool shell before the Council can impose penalties such as fines or possible drainage. 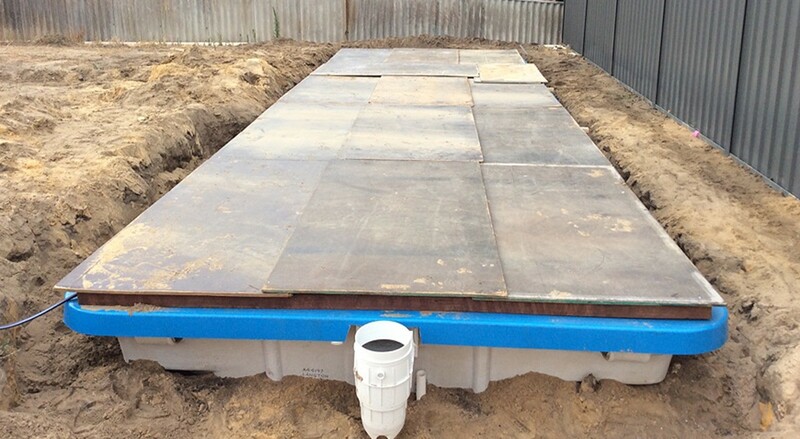 Our F17 Grade sturdy Board and Plank covers meet WA Council requirements and can be errected quickly ensuring a safe work environment.